BOXING legend Manny Pacquiao has achieved so much and fought countless number of competitive fighters in his 24-year boxing career. The Filipino icon is the first and only boxer in history to become an eight-division world champion. He started at flyweight (108 pounds) and went all the way to light-middleweight (154 pounds). He is currently fighting at welterweight. As he trains ahead for his upcoming clash with Adrien Broner, Pacquiao recalls some of his greatest competitors in the ring when he spoke to the media. In terms of being a global pay-per-view attraction, Pacquiao has generated approximately 19.2 million in pay-per-view buys and an astonishing $1.2 billion in revenue from his 23 PPV bouts. According to Forbes, he was the second highest paid athlete in the world as of 2015. With regards to Broner, 29, The Pacman insists that Broner is no easy fight for him. “Broner is not a tune-up fight,” he says. According to a poll conducted by Editinking, out of 240 plus voters, 44% of them picked Pacquiao by points and 38% by knockout. The pair will be fighting this Saturday night at the MGM Grand Garden Arena for Pacquiao’s WBA ‘Regular’ belt. But what styles, skills, and selection of punches does each fighter have? 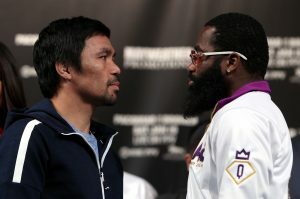 What does Broner have to do to resurrect his career and what does Pacquiao have to do to avoid retirement? Let us take a look at from an analytical point of evidence in records, opposition, and achievements. Broner’s record stands at 33 wins, three losses and one draw. His height consists of five feet six inches and 69” reach. In terms of big achievements, after he defeated Paulie Malignaggi for the welterweight title, Broner joined the likes Roberto Duran and Roy Jones Jr after capturing a world title in just their first bout after jumping two divisions. There was a time where Broner at the age of 23, had a record of 27 wins, with 22 KOs and no defeats. That was until he met his nemesis Marcos Maidana who completely dismantled Broner in their December 2013 bout. ‘The Problem’ had been solved courtesy of two knockdowns via unanimous decision by the Argentinian Maidana. Giving him his first ever loss. In Broner’s last six bouts, he’s won three, lost two and one draw. In terms of competitiveness, he’s beaten Daniel Ponce de León, Antonio DeMarco, Gavin Rees, Paul Malignaggi, Khabib Allakhverdiev. But lost to Maidana, Shawn Porter and Mikey Garcia. Broner’s style and skill set consist of footwork, timing and counterpunching. He is able to use his right hand effectively and load up some vicious power to it. His countering is often done retaliating from the left jab of his opponent. Majority of the time, Broner breaks the range depending on the footwork of his opponent. He can exchange on the inside with his punches but tries to avoid being hit back. His accuracy is a plus point considering that his punch stat accuracy of power punches stands around the rate of 44%, nine connecting per round, according to Compubox stat. In his last bout with Jesse Vargas, Broner landed 152 power punches with a connect percentage of 43%. However his activity level is poor with an average of 38 punches thrown, whilst the average welterweight throws 57. His average landing is 13 while the rest of the welterweights land at 17. Pacquiao has been fighting since 1995 and boasts a record of 60 victories, seven losses and two draws. His height is five feet 6 with 67 inches of reach. By level of competition, he’s faced 19 former, current or future world champions. Four of them he’s fought more than once. Just to name a few: Marco Antonio Barrera (twice), Erik Morales (twice), Juan Manuel Marquez (four times), Oscar De La Hoya, and Antonio Margarito. The Filipino Slugger is known for his exceptional speed of reckless retribution and immense immortality of footwork. By weaponry, his left hand is the most dangerous punch. One example of this was back in 2009 when Ricky Hatton was knocked out cold in round two by the Pacman’s devastating left hook. Horror, shock and astonishment were struck like lightning on the eyes of the audience. In Pacquiao’s last six bouts he won four and lost two. Many would argue that the loss to Jeff Horn should have gone to Pacquiao. In his last six bouts, Pacquiao’s activity level just like Broner is lacking the superstitious work of the average welterweight. He throws at 41 and lands about 13. His power accuracy is 39% with nine connecting per round. Based on the numbers, it would indicate an equal level of compatibility. However, depending on the context of the bout, it could vary. One thing must be known is that Broner has fought five times in the welterweight division and it has been a hard-hitting weight class for him. He’s won two, lost two and one draw. Even with the two victories they remain disputed by many fans today. This bout is a make or break fight for Broner. It’s the only fight he has in order to resurrect his career and he needs to really bring the best out of him. He needs to whisper the words of revival and restoration to his fans and to Pacquiao himself. Like I mentioned in the analysis, the welterweight division hasn’t been that nice to Broner and the competitors are going to get harder for him. He hasn’t had a win since February 2017 when he controversially beat Adrian Granados. Should, he beat Pacquiao, it will put Broner back in the frame of level competition and this is something he can’t take for granted. For Pacquiao, he insists that he has one more fighter after Broner to finish. Whether it’s Floyd Mayweather or not is irrelevant but Pacquiao has to deliver a performance that will make Broner lose his tracks. We saw the finish against Matthysse and it felt like it was the Pacquiao of old. The eruption of the crowd was so loud it felt like the turn of the century had just arrived. It had been over nine years since Pacquiao last won by KO. It felt like the Almighty had sent His words to Pacquiao and he was granted a wish. Indeed, thou shall receive what he desires. I don’t see any other alternative way for a fighter in his 40s, who’s achieved so much in his career and intends to do great things for the people of his country, should he lose to Broner. It’s either the possibility of a resurrection for Broner if he wins or retirement for Pacquiao if he loses.